« Happy Thanksgiving and Thank you! 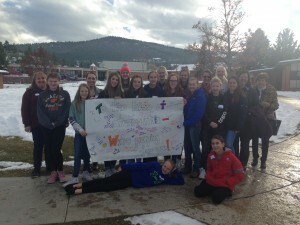 Helena’s Community Service Center and Residential campus were bless to have a visit from Intermountain Presidential Council member Pat Floyd, youth leader Tina, and 15 amazing youth from Van Orsdel United Methodist Church in Havre, Montana earlier this month. 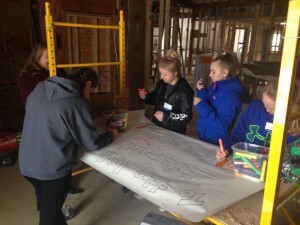 The group started out at the Community Service Center with Terry Chaney, who fed them lunch and gave a program on the history of Intermountain and answered a lot of questions about Intermountain’s mission and ministry. It was a wonderful place to start the visit and gave the group insight into the interventions and activities that our community-based programs engage in, reaching hundreds of children and families every day. Next, the group traveled up the hill to join me for a quick explanation and tour of the Residential campus, visiting McTaggart cottage as well as getting to see the construction going on in the former Bridger cottage. That cottage is being transformed into Van Orsdel Commons, a place where chapel activities, Jewish mentoring, and cultural activities will take place for our children. Additionally, the Commons will include a café and study lounge space for both children and staff, extra room for special cultural projects and artistic creations, house our puppet stage, and allow for additional occupational therapy activities for children and wellness programs for staff. 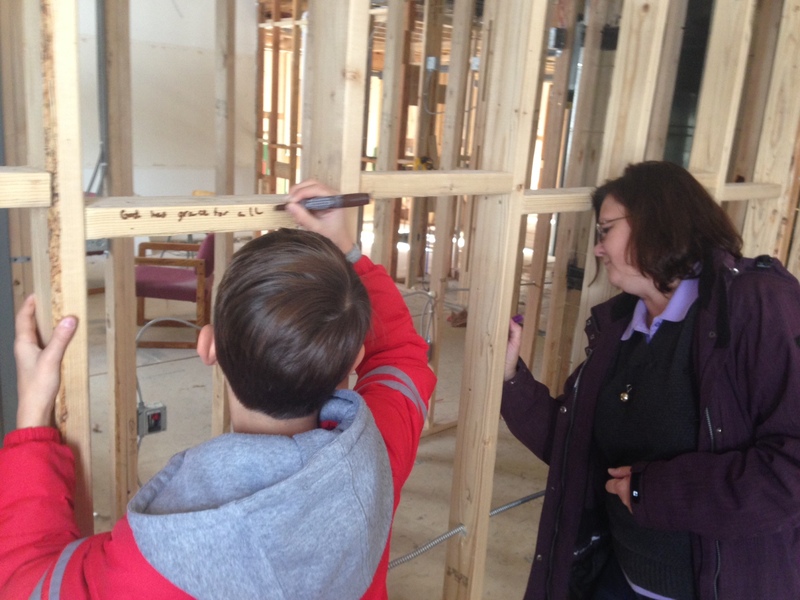 I was especially touched to have the group write prayers on the 2×4 studs in the walls… words of blessing and encouragement that will surround those that will use the Van Orsdel Commons for years to come. In between small groups touring the Van Orsdel Commons, the group helped Heather Rae, our donations manager, down in the “Treasure Chest.” The Treasure Chest is our donations room, and there is almost always lots of work to be done in that space. It is set up like a small store with items of clothing, school supplies, shoes, jackets, and some toys and games. When individuals or groups donate items (perhaps in response to the “Wish List“) they come down to our donations room and need to be sorted and placed out in the Treasure Chest so staff can take children there to select items as needed for their care and for special celebrations like birthdays and Christmas. 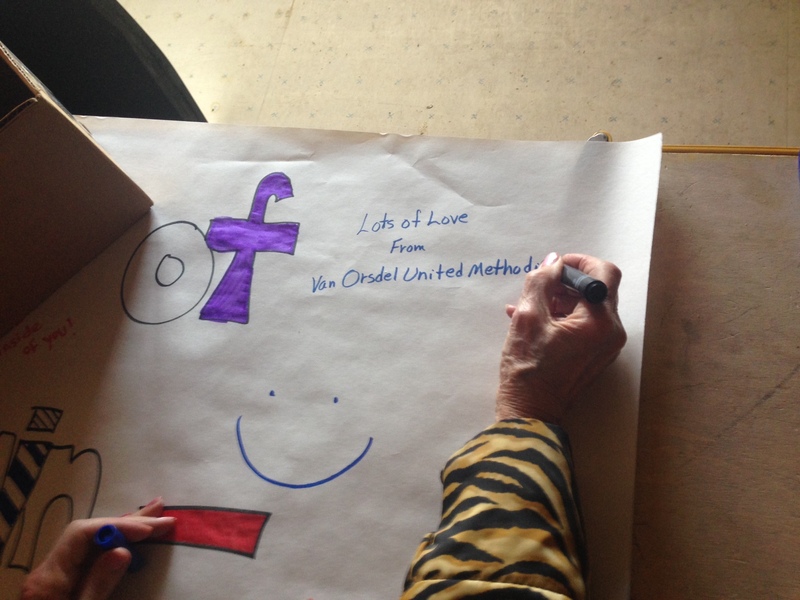 Throughout this post, you can see pictures from the visit, including a mother and son that attended and wrote prayers of blessing on the walls of the chaplain’s office as well as the hand of Intermountain Presidential Council Member Pat Floyd signing the poster the youth created to encourage our children. The poster reads: “To the children of Intermountain, we are praying for you!” Pat signed the poster, writing: “Lots of love, from Van Orsdel United Methodist Youth.” The poster is hanging in the space we now use for chapel activities, the MPR (Multi-purpose room), in the Bob Wix Building. I am excited to see how the relationship between Van Orsdel UMC and Intermountain will continue to grow. Tina, the leader who attended with 15 of her amazing youth, expressed interest in possibly coming back in 2018 to participate in our yearly VBS Day Camp! 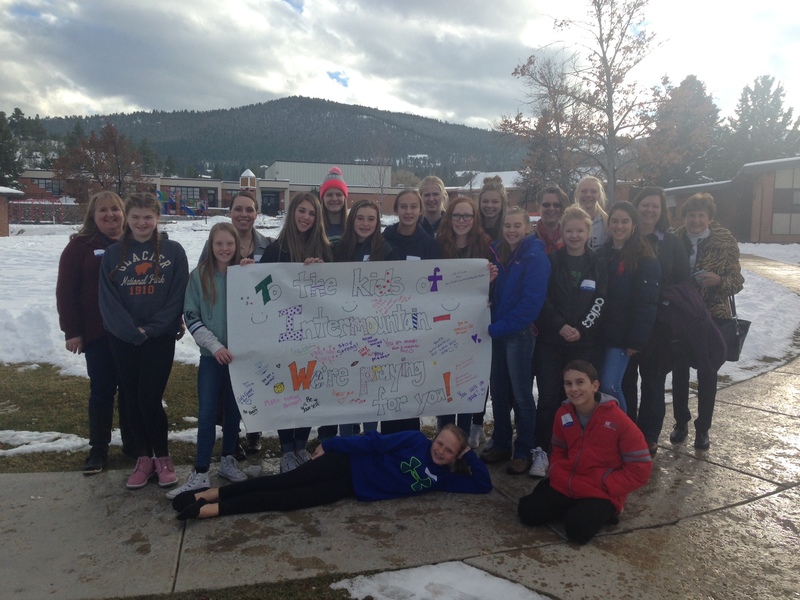 It was amazing and inspiring to see a group of young people that were truly engaged and ready to assist in Intermountain’s mission of “healing through healthy relationships” any way they could!